Once the largest nation in Africa, Sudan now ranks third in size after losing nearly a third of its territory to the newly created nation of South Sudan in 2011. Sudan is characterized by its varied ecologies, highly differentiated agricultural production patterns, significant sources of fresh water in the Nile River system and mineral reserves (principally petroleum). The country’s 34 million people include diverse groups with contrasting and often conflicting cultures and means of producing livelihoods. Violent conflict over resources, revenues and aspirations has defined Sudan’s history. A civil war that lasted 20 years and killed more than 2.5 million people concluded with the signing of the Comprehensive Peace Agreement (CPA) in 2005 and later, in 2011, a referendum that created the newly independent state of South Sudan. While the CPA has brought a diminution in violence, conflict over political control and access to resources continues among populations in the Darfur region in the west and in the oil producing regions that straddle the country’s border with South Sudan. The Khartoum government’s repressive appropriation of land and systemic abuse of local land rights were significant factors fueling the civil war. As part of the peace process, the Government of Sudan (GoS) and the Government of South Sudan (GoSS) recognized the need to develop land policy, land legislation, and functioning land institutions and supporting services. Unfortunately, many stipulations in the CPA, intended to address long-contested natural resource and land issues, remain unfulfilled. Land commissions at the national level and in the States of South Kordofan and Blue Nile, that were to arbitrate land disputes, recommend land policy reforms and identify a mechanism for recognizing customary land rights, have not been established. As a result, rights of access –to agricultural land for cultivation of crops and livestock production, water for irrigation, and to forest products and petroleum reserves for export revenues –continue to be contested at national, regional and local levels. In Darfur, the land commission required by the Darfur Peace Agreement (DPA) has been operational since 2007 and has made progress in providing information and policy recommendations to improve land governance. The Darfur Land Commission (DLC) faces considerable challenges, however, due to fiscal and technical capacity constraints and lack of coordination with other government institutions, particularly at the national level. In the absence of a functioning and socially legitimate system to identify and enforce formal and customary land rights, tenure security has increased in the face of commercial pressures to develop agribusiness and explore for and extract oil. Under formal law, the GoS has been free to issue long-term leases to unregistered land without consulting local communities, while smallholders and pastoralists have been evicted from land and denied access to natural resources in favor of private investors, land speculators, military personnel and elites. Most of the country’s urban population – including millions of internally displaced persons (IDPs) and rural residents whose means of livelihood have been destroyed – live in informal settlements without secure rights and are vulnerable to eviction and the destruction of their residences. The failure to resolve these systemic challenges will also affect the ability of the populations of Darfur and border regions of Abyei, South Kordofan and Blue Nile to achieve long-term peace, and will complicate the resettlement process for millions of IDPs. For Sudan to find lasting peace, issues of security and access to land and natural resources will require urgent and sustained attention. Land matters and the reform of Sudan’s land administration systems were key components of the Comprehensive Peace Agreement. Chief among the promised reforms was the establishment of an independent National Land Commission, and State Land Commissions in South Kordofan and Blue Nile, each of which would be responsible for recommending land policy reforms and resolving historical claims over land. These reforms are specifically to include recognition of customary rights and customary land law. To date, the GoS has failed to establish the National and State Land Commissions in South Kordofan and Blue Nile. While in Darfur, the DLC has been operationalized but requires continued technical and financial support in order to improve the capacity and capabilities of the institution. Sudan’s future stability and the prevention of conflict depend on the development and implementation of comprehensive legal frameworks and governance structures for land and natural resources, of which the commissions are a key component. Donors can continue to support the establishment of the National Land Commission and South Kordofan and Blue Nile Land Commissions, and capacity development of the Darfur Land Commission. Donors can also support the creation of new or revised legal frameworks for land, water, forests and minerals that address chronic gaps and pressure points, and that establish necessary governance bodies at all levels as well as mechanisms for enforcement of rights. In addition to support for legal frameworks, donors ought to continue efforts to assist the government in creating and strengthening core institutional structures at every level, helping to create appropriate links between the institutions and the public, and designing and implementing public awareness building programs. The customary regimes that govern and inform rights to land and water – especially in the border states, the Darfur region and for pastoralists – need to be identified, documented and integrated into formal law. Donors can assist the government by continuing to collect information about customary rights, coordinating their efforts to ensure regional coverage and implementation of best practices, and by providing technical assistance and comparative knowledge on the process of integrating customary rights into formal law. The rights of IDPs to land and housing and the authority over land allocation for IDPs need to be established and clarified, and the information disseminated to local governments and the population of IDPs. Donors can identify resettlement trends and regional needs to accommodate returning IDPs. Public awareness campaigns and capacity building will assist the IDP population and state and local governments in understanding land and housing rights and creating realistic plans that include recognition of the most vulnerable groups, including women, returnees, IDPs and those affected by HIV/AIDS. Rapid urbanization across Sudan has outpaced the capacity of government institutions to create and implement master plans and develop policies for upgrading and regularizing informal settlements. Donors can assist the GoS in developing appropriate strategies for urban planning and settlement upgrading. Technical assistance is needed to help draft and implement legislation and programs to regularize informal land rights, paying particular attention to vulnerable groups such as IDPs, households affected by HIV/AIDS and households headed by women and children. Conflicts among competing groups over access to and control over land and water are common in Sudan, and the decades of war, prevalence of weapons and numbers of people with combat experience have increased the likelihood of disputes turning violent. Establishment of an effective, integrated, socially legitimate system for resolving disputes over land and other natural resources is critical to Sudan’s future. Donors can assist the government in assessing the actual and potential roles played by traditional authorities and forums and by formal legal institutions, as well as options for creating a system that integrates formal and customary components and supports local governance bodies in their implementation of laws and policies. Once lauded for its agricultural potential, Sudan has become mired in protracted conflict that has stalled its development and caused massive population displacement. Two civil wars – fueled by competition for natural resources and the concentration of power in the northern-based central government – consumed most of the 50 years following Sudan’s independence. The majority of Sudan is classified as arid land, with more than one-third of the country classified as desert. Most of the desert regions of Sudan are undeveloped and support low-intensity pastoralism and isolated oasis communities. The Nile riverine strip is the exception, supporting significant agricultural activity that has been enhanced by irrigation schemes. Sudan’s population of 34 million is approximately 60% rural. Khartoum, the capital, has an estimated 5–7 million residents, including 1–1.2 million IDPs. In 2012, Sudan had an estimated GDP of US $51 billion. Agriculture accounted for 31% of the GDP, industry for 24% and services for 45%. The oil sector’s contribution to GDP has been approximately 15% in recent years. Revenue from oil is expected to drop significantly, however, given that 75% of the oil reserves are located in what is now South Sudan. Formal law, including Islamic law, governs land access and tenure security. Formal law provides that all unregistered land – which comprises 90% of the country’s land – is owned by the government. Customary land tenure systems exist throughout Sudan but are not formally recognized by the government. In urban areas, state ownership of land predominates, and the government allocates land through formal leases. Informal leases between individuals remain common in communities and informal settlements that have not been subjected to government allocation of lands. Eviction, demolition and relocation of communities have been common in Khartoum as the government asserts control over land to implement its urban planning strategy. In many rural areas throughout the country, customary institutions manage land use and allocation. Land tenure insecurity has resulted from government-sanctioned evictions, which remain legal under formal law, as well as the GoS’s failure to recognize customary rights. In much of Sudan, Shari’a law governs property rights in the event of marriage, divorce and death. Land rights tend to be retained by male family members, and women’s land rights are highly insecure. The basis for this discrimination for the denial of women’s rights to land appears to be grounded in customary law as opposed to religious law. Despite the formal end to the war, and the secession of South Sudan, hostilities between the Sudan and what is now South Sudan continue, particularly over oil. Most of the oil reserves are in South Sudan, while Sudan possesses the pipelines and refineries necessary for export. This has led to frequent disputes between the two nations over revenue- sharing. Conflict also continues to erupt in the border regions of Abyei, South Kordofan and Blue Nile, as well as in Darfur and Eastern Sudan. Disputes over control of the border states of South Kordofan and Blue Nile have led to extensive violence. The prevalence of land mines and the large number of displaced persons have resulted in vast areas of land going unused. Areas of concentrated population (including IDP camps and informal settlements) and areas under ecological pressure have become degraded from overgrazing, deforestation and rapid unplanned urbanization. Farming is encroaching on forests and rangelands. The return of displaced people to parts of the country has caused conflicts over land rights. Half of all returning internally displaced and refugee households are female-headed, and women’s land rights are highly insecure. The authority of the customary institutions historically responsible for resolving land disputes has weakened, and land commissions called for in the CPA have yet to be formed. Sudan has significant freshwater resources, primarily from the Nile River system. For centuries farmers have used the waters of the Nile for irrigation, taking advantage of numerous tributaries and annual flooding. Annual water withdrawals are used almost entirely for agriculture, including irrigation and livestock uses. The Constitution provides that all subterranean, surface and water resources are public property. Water rights are primarily a matter of state and local legislation in Sudan. However, Sudan’s use of water in the Nile Basin is subject to international agreements and obligations related to its membership in the Nile Basin Initiative. Under customary law, community members have a right of access to land and water. Competition over water resources is a common cause of local conflict, especially in areas where resources are limited. Sudan lost a significant portion of its forests with the secession of South Sudan. Forests and woodlands outside of Sudan’s official forest reserves are threatened by expanding agriculture and urbanization or are unsustainably exploited to meet the country’s energy needs. The Forests and Renewable Natural Resources Act of 2002 (FRNRA) governs forest rights and the use and management of forest resources in Sudan. Forest tenure types include forest reserves (federal, state and institutional), community forests, private forests (including corporate forests) and protected areas. The secession of South Sudan resulted in the loss of more than 75% of the country’s oil reserves. As a result, Sudan is now seeking to expand its oil and gas production. However, continuing conflict makes it more difficult to attract foreign investment in the oil and gas industry. Sudan’s total land area is 1,861,484 square kilometers and the country is bordered by the Central African Republic, Chad, Egypt, Eritrea, Ethiopia, Libya, South Sudan and the Red Sea. The dominant geographic feature of Sudan is the Nile River, which flows 3000 kilometers from Uganda in the south to Egypt in the north (USDOS 2012). Sudan is generally flat, with some mountains found in the Darfur region in the west, the Red Sea hills in the north-east, the Jebel Marra plateau in the west and the Nuba Mountains in the south. Desert and semi-desert conditions exist across roughly 60-70% of the country’s land. The majority of Sudan is classified as arid land, and more than one-third of the country is classified as desert. Most desert regions of Sudan are undeveloped and support low-intensity pastoralism and isolated oasis communities. The exception is the Nile riverine strip. The significant agricultural activity it supports has been enhanced by irrigation schemes (UNEP 2012a; UNEP 2007). The region north of Khartoum consists of desert and the Nile Valley. The central and southern regions of the country consist largely of the Sahel belt and the humid savannah where most of the country’s rain-fed and irrigated agriculture is practiced. Prior to the independence of South Sudan, 57% of the unified country was comprised of agricultural land, with irrigated land constituting 1% of Sudan’s total cultivated land and supplying over half of the country’s agricultural production. Post secession, it is estimated that less than 13% of Sudan’s land is cultivated (UNEP 2012a; World Bank 2009; UNEP 2007). Sudan’s population of 34 million is approximately 60% rural. Urbanization is on the rise, however, as a result of insecurity in rural areas and the perception of greater opportunities in urban centers. The population is highly diverse; the northern region is populated mostly by Arabized African Muslims while the population in the south, along the border region with South Sudan, comprises primarily black African animists and Christians. The majority of residents of the western region of Darfur are black Muslims. Approximately 70% of Sudan’s population are Sudanese Arab (including Shaigiyya, Ja’alin, Misseriya, Kababish and Rizegat), and the remainder consist of Fur, Zaghawa, Massalit, Beja, Nuba and Dinka Ngok. Within these broad groups are dozens of ethnic and tribal groups (World Bank 2011b; UNEP 2012a; CIA 2012; USDOS 2012; UNEP 2007; FAO 2005). In 2011, Sudan had an estimated GDP of US $51 billion. 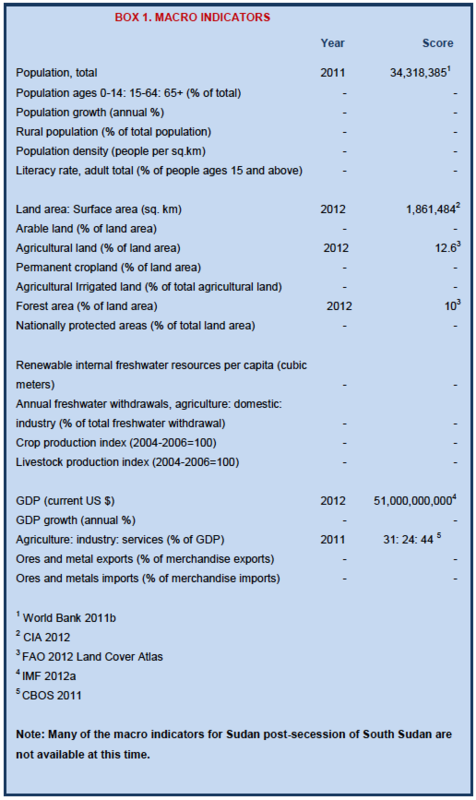 Agriculture accounted for 31% of GDP, and industry and services 24% and 44%, respectively. The oil sector, which is included in the industrial sector, has accounted for approximately 15% of nominal GDP in recent years. Agricultural land continues to be an important resource, while oil production and revenues are expected to drop significantly as a result of South Sudan’s independence, since 75% of the known reserves are found in South Sudan. The development of the oil sector led to a sharp rise in foreign investment during the interim governance period of the CPA and boosted the development of the industrial sector. It is unclear what impact the independence of South Sudan and renewed conflict in the border oil producing regions will have on foreign investment in Sudan going forward (IMF 2012a; IMF 2012b; World Bank 2012; USEIA 2012; World Bank 2011a; USDOS 2012). When Sudan was a unified country, 28% of its land area was forested, with an annual rate of deforestation of 0.8%. The majority of Sudan’s forests were found in what is now South Sudan. Rangelands covered roughly 117 million hectares spread over most of the formerly combined country’s ecological zones. As a result of secession, Sudan lost 75% of its forest resources and the deforestation rate jumped to 2.2% (UNEP 2012b; World Bank 2010; USDOS 2012; UNEP 2007; FAO 2005). The five western states that make up the Darfur region have been under environmental pressure for decades. Much of the population in the semi-arid region has relied on herding and subsistence agriculture for survival. The region is experiencing significant environmental change – rainfall in some areas of the country has been steadily decreasing over the last 40 years, and the Sahara desert is advancing about a mile a year, eliminating grazing land and water holes. Forest ecosystems throughout Sudan have been degraded due to fire, uncontrolled grazing, overcutting and encroachment by agriculture. Drought and increasing pressure on land due to the expansion of commercial farming have restricted rangelands, and overgrazing is a growing problem. Almost all livestock is managed by semi-nomadic and nomadic groups. Environmental degradation and competition for limited natural resources have contributed to conflict in the region (UNEP 2012a; Bruce 1998; IRIN 2008; UNEP 2007). The population of Sudan is primarily located in the urban areas, along the Nile River, and in areas of industrial and mechanized agricultural development. The desert and semi-desert areas of the region, primarily in the north and west, support isolated communities and low-intensity pastoralism. With the exception of the Nile River strip and the Red Sea coastal plain, the desert regions of Sudan are relatively undeveloped. Along the Nile River, well-irrigated farms raise cash crops (UNEP 2007). Khartoum, the capital, has an estimated 5–7 million residents, including a UN-estimated 1–1.2 million IDPs from southern conflict zones and from drought areas in the east and west. Most residences are single story buildings, constructed on plots of 300–500 square meters. Large unauthorized settlements are growing on the outskirts of Khartoum and Sudan’s other cities and towns. The settlements are characterized by lack of planning, inadequate water and sewage services, and the prevalence of disease. Khartoum hosts an estimated 96 different informal settlements, housing 2–3 million people. Since independence, four master plans for the city have been created, but they have been only partially implemented, and a fifth effort is ongoing (UNHCR 2012; IDMC 2011; Pantuliano et al. 2011; UNEP 2007; Rahhal and Abdel Salam 2006). The semi-arid Sahel belt crosses the country’s central region. Most agricultural production in Sudan is located in the Sahel and southward. In the central area, most of the natural vegetation has been cleared and replaced with flat, open agricultural fields. Both rainfed and irrigated agriculture are practiced in the region, and large areas are devoted to mechanized farming enterprises (UNEP 2007). As of January 2012, Sudan had an estimated 2.4 million IDPs, primarily displaced from homes and land in the southern and western (Darfur) regions and living in both rural and urban areas in the north and IDP camps. In addition to the IDPs, as of 2012, there were 500,000 Sudanese refugees, most of whom are living in neighboring countries. IDPs and refugees have begun to return to their land and residences or are settling on land provided for them by traditional authorities and local governments. Since the signing of the CPA in 2005, an estimated 2 million IDPs have returned to the Abyei, South Kordofan and Blue Nile regions. The returning population is primarily practicing subsistence agriculture, competing for land with nomadic tribes. In other cases, some IDPs are choosing to remain in IDP settlements, putting pressure on natural resources and services in areas often ill-suited for large permanent settlements (UNHCR 2012; UNMIS 2011; UNEP 2007; de Geoffroy 2007). Sudan’s current interim constitution was installed in 2005 following the signing of the Comprehensive Peace Agreement. The Interim National Constitution (INC) does not directly address land rights and ownership of natural resources, but it does sanction the establishment of a National Land Commission to direct the development of land policy, the adjudication of land disputes and the development of policies for the recognition of customary land rights. State Land Commissions are also called for in Blue Nile, Southern Kordofan and Darfur States to exercise the powers of the National Land Commission at the state level. To date, the Government of Sudan has not taken steps to form the National Land Commission or State Land Commissions in South Kordofan and Blue Nile. The Darfur Land Commission was established in 2007. Sudan is now in the process of drafting a new constitution to replace the Interim National Constitution (UNEP 2012a; Pantuliano 2007; Nucci 2004; Alden Wiley 2010; Sudan Tribune 2012). The legal framework governing land in Sudan is a complex mix of statutory law and customary law that have evolved over time, with little to no coordination between the two. The formal laws governing land include colonial era laws and a handful of post-independence statutes relating to the registration of land and its impact on land rights, and the legal framework regarding land access. The Land Resettlement and Registration Act (1925) (LRRA) is the primary reference for details on land settlement and the registration of rights. The LRRA also consolidated government ownership over land by establishing that all unoccupied land is presumed to be state land. The Unregistered Land Act (1970) served to nationalize all unregistered land in the country. The Act provided that all land that had not been registered at the time of the Act’s passage was state land. The state retained land ownership and could grant leasehold interests to individuals and entities, in effect allocating land for commercial development without regard for customary rights (UNEP 2012a; Rahhal and Abdel Salam 2006; Alden Wily 2008; De Wit 2001). The Civil Transaction Act (1984) repealed the Unregistered Land Act, but retained the principle of state ownership of land. The Act provides the framework for transactions in land, including leases and easements, transfer and inheritance of rights, and conditions for obtaining usufruct rights. The Act affirms the government’s authority to administer rights over land and provides that registered usufruct rights to land are equal to registered ownership rights to land. The 1984 law also introduces Sharia law into the formal legal framework and includes a requirement that the government provide compensation when it appropriates land (UNEP 2012a; Rahhal and Abdel Salam 2006; Alden Wily 2008; De Wit 2001; Bruce 1998). The Local Government Act (1998) identifies land management and administration responsibilities of local authorities. The Act was adopted in effort to fill the void that was left by the Government’s elimination of Native Administration in the 1970s. The Act confers on local authorities responsibility over (1) establishment and function of local land management committees; (2) development of local laws regulating land management; (3) involvement of customary authorities in land management; and (4) accountability mechanisms for land management (UNEP 2012a; Rahhal and Abdel Salam 2006; De Wit 2001). Formal law provides that all unregistered land (90% of the country’s land) is owned by the government. Individuals and entities can obtain leasehold interests of various durations and terms. Islamic law recognizes individual freehold interests in land, and land that was registered as of 1970 is considered privately owned (UNEP 2012a; Nucci 2004; Alden Wily 2008; Bruce 1998; Rahhal and Abdel Salam 2006). Customary land tenure systems exist throughout Sudan and govern the practices of pastoralists in the north, the semi-feudal systems that developed on land close to the Nile, and the practices of southern and western tribes. Customary law varies throughout the country, but tends to share the following general characteristics: land is considered to belong to the people; land is not formally registered; land remains with the tribe or clan and cannot usually be sold to outsiders; most land rights are use rights, and land is considered retained by a household until abandoned (and in some circumstances even if abandoned); and rights to land and its natural resources may overlap. Most groups distinguish between land used for grazing and hunting and land used for farming and residences, and different rules apply to the various land categories. Local leaders determine who has rights to land and other natural resources and who must seek permission for use of land (Rahhal and Abdel Salam 2006; De Wit 2001; De Wit 2004). In Sudan, land use and access rights derive from both customary institutions and formal statutory law. Formal law, including Islamic law, governs land access and tenure security. Land can be obtained through inheritance or by land sales and leasing. Land sales and leases can be registered, and registered land is considered the most secure. Islamic law recognizes the principle of shufa’a, which allows a neighbor or co-inheritor of land a right of first refusal when the right-holder transfers the land. The recognition and use of formal law is predominant in urban areas and towns (UNEP 2012a; Nucci 2004; Bruce 1998; Rahhal and Abdel Salam 2006; De Wit 2004). In many rural areas throughout the country, customary institutions manage land use and allocation. Community members have a right to access land for use as their residence and for farming. Traditional leaders have the authority to allocate land to members of the community. In areas with available land, those in need of land may clear and use unoccupied land. In more densely populated areas, land is most commonly obtained by inheritance. If someone leaves an area, the traditional leaders usually reallocate the land. Customary systems in Sudan are diverse and vary significantly across the country. Although prevalent throughout the country, customary rights are not formally recognized by the state (De Wit 2004; Bruce 1998). In urban areas, formal and informal leases of state-owned land are the most common tenure systems. The terms of leases vary and are often undisclosed to tenants. Plots offered under formal leases are rare and expensive, and most urban and peri-urban residents live in informal settlements with limited or no services. The government has used the demand for housing to forcefully evict occupants and demolish informal settlements. The sites are then allocated (leased) by the government to investors for new residential construction (De Wit 2004; Rahhal and Abdel Salam 2006; de Geoffroy 2007). Historically, land tenure insecurity has resulted from the imposition of formal law that does not recognize individual rights to unregistered land. State authorities have considered unregistered land to be state land and thus available for the state to transfer to private commercial interests, the military, land speculators and elites without regard for customary rights. Although the CPA required the development of laws to incorporate customary laws and practices, local heritage and international trends and practices, the Sudanese government continues to issue new long-term leases over community lands to commercial interests and well-connected individuals without consulting local populations or obtaining their consent. Many of these new large commercial leases have involved prime farmland and have been made to international investors from the Gulf States, South Korea and Egypt. As a result of the rapid privatization and commercialization of lands by the government, especially in the border regions, customary land tenure systems are gradually breaking down (Alden Wiley 2010, Large and El-Basha 2010; Pantuliano 2007; Rahhal and Abdel Salam 2006). In urban areas in the border regions, military personnel have taken advantage of their positions to occupy residences or construct buildings on land that owners left vacant when they fled the violence. The military personnel have been unwilling to vacate the land upon the return of the owner, or have claimed ownership rights and sold the plots to others. In Darfur, various groups have taken advantage of the years of conflict and the unsettled nature of land rights. In western and southwestern areas, lands that non-Arab sedentary groups, like the Masalit and Fur, occupied before the conflict, have been taken or are being used by nomadic Arab groups such as the Mahariya and Missiriya (Nucci 2004; De Wit 2004; Alden Wily 2008; Pantuliano 2007). 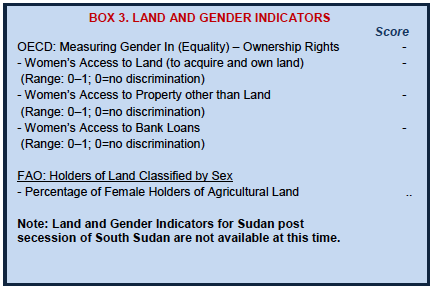 Women’s land rights are highly insecure in Sudan. Many community members obtain land through customary land allocations, and the land is commonly granted to male family members. A woman’s rights to the land are derived not as a result of her status as a member of the community, but as a result of her relationship with her husband, father, brother or other male relative. Women rarely have direct rights to land, and when a household is disrupted by death or divorce and the woman’s relationship with the male landholder terminates, she may be unable to retain her access to land. Male family members may sell or transfer the family land without the woman’s consent or simply deny her rights to use the land (De Wit 2004). In much of Sudan, Shari’a law governs property rights in the event of marriage, divorce and death. Shari’a law recognizes women’s rights to hold property, but according to local custom land rights tend to be retained by male family members. Daughters are entitled to inherit a share of land from their fathers, but the share is usually half that received by sons, and daughters customarily relinquish their shares to their brothers in order to keep family land intact and in exchange for support by the brothers, if necessary (De Wit 2004; Bruce 1998). Women face special obstacles when trying to access land after divorce or death of a husband. In both cases it is common for male relatives to sell family land without consent or even notice to the woman. In order for widows to claim inherited leasehold rights from the government they must obtain a death certificate, which is difficult to procure. This requirement is particularly challenging for the estimated 45–50% of women-headed households found in the IDP and refugee communities. In rural areas where customary law prevails women’s access to land is often hindered because they have only indirect rights to land under most customary tenure systems (De Wit 2004; Pantuliano 2007). The reform of land administration institutions was a key component of the CPA. The CPA required the establishment of a National Land Commission and State Land Commissions (for South Kordofan, Blue Nile and Darfur) responsible for: establishing land policy within their respective jurisdictions; enforcing land law; resolving land disputes; assessing compensation for land acquisitions; studying and recording land-use practices in areas where natural resource development occurs; conducting hearings; and formulating their own rules of procedure. Land Commissions have yet to be established at the National level and in South Kordofan and Blue Nile States, and as a result, land administration practices and institutions in much of Sudan remain substantially as they were prior to the CPA. The Darfur Land Commission was established in 2007 as part of the Darfur Regional Authority. Since its founding, the DLC has engaged in projects related to collection of customary laws and practices and land use and natural resource mapping (UNEP 2012a; Alden Wiley 2010; Ottaway and El-Sadany 2012). Most government land administration functions in Sudan have been devolved from the federal government to the state level. To the extent that the federal government remains involved, it is largely responsible for setting standards and providing training and guidance to the state authorities. However, in many federal ministries, the precise allocation of responsibilities and authority remains unclear (UNEP 2012a; De Wit 2001). At the state level, there are three primary institutions responsible for general land administration, surveying and the judiciary. The Government Land Disposition and Committee, responsible for allocating land, is comprised of individuals from other state level Ministries. The Survey Department performs physical planning and surveying of urban plots, and is housed within the State Ministry of Engineering Affairs. Within each state there is also a Land Registration Office that is part of the Civil Court and is responsible for maintaining a state land registry. These institutions’ capabilities vary significantly from state to state, but all lack necessary training and resources (De Wit 2001). It is at the locality (mahalia) level where customary authorities intersect with formal government institutions. Each mahalia supports a Land Conflict Resolution Committee that is responsible for resolving land disputes. Customary authorities typically play a prominent role on these committees. Disputes that cannot be resolved by the committee may be taken to Civil Court (De Wit 2001). A variety of customary institutions continue to function to some degree in much of Sudan’s rural areas. In some areas, traditional leaders continue to allocate land, and many such leaders maintain some record of land occupancy and transfers. The Native Administration is a form of a clan and tribal administration that administers the affairs of the tribal groups according to their norms and traditions. Historically, Native Administrations were responsible for local issues affecting their communities, such as agricultural land-use practices, access to pastures and water and land, and natural resource conflict resolution. In the early 1970s the GoS attempted to abolish Native Administrations and replace them with local government offices, but the Native Administrations had substantial social legitimacy and survived in many areas. In 1986, the GoS adopted the Native Administration Act, which reinstated the Native Administration system, albeit with much reduced powers for the traditional leaders. More recently, reformers question the role of these traditional authorities, arguing that the system should be restructured in order to promote greater accountability, eliminate corruption and protect the legal status of women and other vulnerable groups and communities (Bruce 1998; Pantuliano 2007; Mohammed 2007; Rahhal and Abdel Salam 2006). Under the Civil Transaction Act of 1984, land transactions must be registered. In Khartoum, land registration requires six procedures and nine days, and costs 3.1% of property value. Only a very small percentage (10% or less) of land in Sudan is surveyed and registered. Urban cadastral information is largely nonexistent or in disarray. 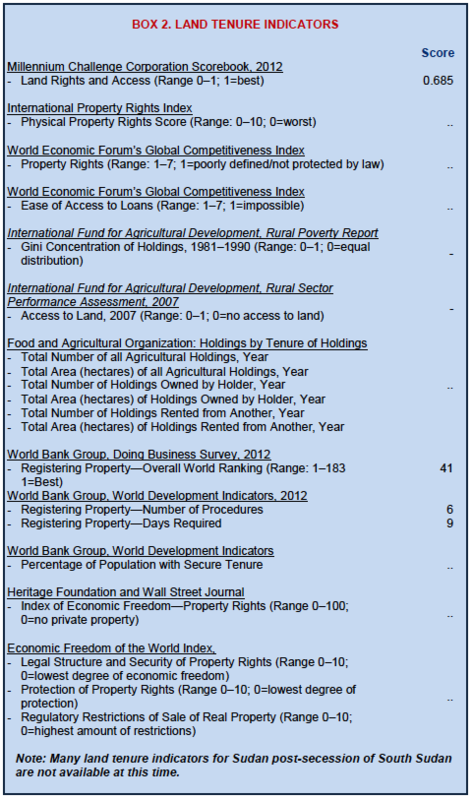 Most land transactions are informal and not registered (World Bank 2012; De Wit 2004; Nucci 2004). Government leasing of land to private investors, often large-scale enterprises, has become common in Sudan. Since 2007, it is estimated that the GoS has commercially leased out approximately 3.9 million hectares. This figure is in addition to the roughly 12.5 million hectares of land commercially leased out by the government prior to 2005. Approximately 78% of these post-2007 leases went to domestic investors, but many of these are backed by foreign banks or agencies. In Blue Nile state, government officials have acknowledged recording 62 commercial leases, most of which are for 10000 feddan (10380 acres) or more. Common characteristics of commercial leases throughout Sudan include lack of public notification, contradictory lease terms and conditions resulting in different rules for different applicants, and lack of coordination between the national and state governments (Alden Wiley 2010). Under the 2005 Interim National Constitution, private property cannot be expropriated except in accordance with law and for the public interest. Prompt and fair compensation must be paid. The Land Acquisition Act (1930) is consistent with the constitutional provisions. The Acquisition Act authorizes the state to take private property in the public interest, under terms consistent with the Seventh Constitutional Decree (1993) and the Civil Transactions Act (1994) (UNHCR 2005). Since independence, the Sudanese government has expropriated land without due process or payment of compensation. The GoS has relied on formal law – the Unregistered Land Act of 1970 and the Civil Transaction Act of 1984 – to designate all unregistered land as state land. The Unregistered Land Act further legitimizes expropriation by expressly authorizing government eviction of occupants on unregistered lands, through the use of reasonable force if necessary. This legal dispossession of unregistered lands, which account for 90% of all lands, appears to be the most common form of expropriation in Sudan. Land seizures have been common in the states of South Kordofan and Blue Nile, and in the eastern region. The state has seized land and leased it out to private entities for development of large mechanized farming operations. The government has used gunships and helicopters to clear people from villages to secure land for the development of oil fields. The forcible displacement of people, especially from South Kordofan, caused many to join the Sudan People’s Liberation Movement (SPLM) insurgency. Even after signing the CPA, the GoS continues to lease large tracts of land to private entities for development without consultation with (and to the detriment of) local populations (Rahhal and Abdel Salam 2006; Pantuliano 2007; De Wit 2004; Nucci 2004; Alden Wily 2008; Alden Wiley 2010). Khartoum hosts an estimated 96 different informal settlements, housing 2–3 million people. After several failed efforts to manage settlement growth, Khartoum’s government resorted to demolition as a primary method of urban planning. Since 2004, the government has demolished seven IDP camps, bulldozing settlements with little warning and displacing more than 665,000 residents, none of whom (have) received compensation. Twice that number of camps have been destroyed since 1990. In several cases, the government forced residents of informal settlement camps into remote desert locations that lack services and livelihood options. For example, in 2008–2009, the government demolished and relocated an estimated 10000 people from the Mayo neighborhood in Khartoum. Some of these families were re-allocated plots within the redesigned community of Mayo, but more than two-thirds were relocated to remote areas (Pantuliano et al. 2011; UNEP 2007; Rahhal and Abdel Salam 2006; de Geoffroy 2007). In 2005, the Sudan People’s Liberation Movement (SPLM) and the Government of Sudan signed a Comprehensive Peace Agreement (CPA) ending the civil war. The CPA called for a 6-year interim period for peace building, during which the Khartoum-based government and the southern-based SPLM would share power and wealth, including oil revenues. The CPA culminated with a referendum in January 2011, under which the population of southern Sudan voted overwhelmingly to secede from Sudan. Neither the signing of the CPA in 2005 nor the secession of South Sudan in 2011 has brought lasting peace to Sudan. Conflict over resources, especially oil and land, border demarcation, self-determination, and government expropriation of land continue to result in violence between Sudan and its neighbors (primarily South Sudan) and within the country (Ottaway and El-Sadany 2012; CEIP 2011). Conflict in the Border Regions. The Abyei region and the states of South Kordofan and Blue Nile make up what is often referred to as the Transitional or Three Areas of Sudan. Abyei (a county and former district of South Kordofan), South Kordofan state and Blue Nile state lie on the border area between Sudan and South Sudan. These states are officially demarcated as part of Sudan, but have historical, ethnic and tribal ties to South Sudan. The Three Areas are marked by culturally diverse populations, a wealth of natural resources (including oil, agricultural land and water) and longstanding, complex conflicts around political, economic, religious, cultural and social identity issues (Ottaway and El-Sadany 2012; CEIP 2011). The CPA acknowledged that these regions were disproportionately affected by the civil war, and that many of their residents sympathized with the SPLM. As a result, the CPA provided different pathways for each of these regions to define its future relationship with the GoS. Southern Kordofan and Blue Nile were granted a degree of autonomy and an alternative governance structure that allowed for greater local governance and revenue sharing, and the establishment of State Land Commissions to settle land disputes. The CPA also stipulated that popular consultations be held in each state following the national and local elections to ascertain the views of the people on the provisions of the Comprehensive Peace Agreement relevant to their states (Ottaway and El-Sadany 2012; CEIP 2011). In South Kordofan, allegations of fraud around the May 2011 state elections led to violent conflict when Sudanese forces entered the state to disarm rebel groups. Adding to the resentment of the local population is the fact that the popular consultations called for under the CPA have not proceeded, nor has the state land commission been formed. Violence also continues in Blue Nile where Sudanese forces have clashed with the SPLM, causing Sudanese President Bashir to declare a state of emergency and remove the governor. It is estimated that the renewed fighting in these two regions in 2011 displaced 200,000 people in South Kordofan and 66000 in Blue Nile (Ottaway and El-Sadany 2012; IDMC 2011). The CPA describes Abyei as a bridge between the north and the south. The population of the area consists of Ngok, Dinka and Arab Misseriya pastoralists who have traditionally moved their cattle back and forth across what is now the South Sudan border. At one time Abyei was an oil rich region, but boundary revisions by the Abyei Boundary Commission transferred the oil rich town of Heglig to South Kordofan state in 2009. The CPA granted Abyei autonomy during the interim period that the CPA was in effect (July 2005–July 2011) and stipulated that a referendum be held to determine whether Abyei would remain with Sudan or join South Sudan. Scheduled for January 2011, the referendum has been postponed indefinitely after disputes between the GoS and GoSS over who has the right to vote in the referendum. Ignoring the provisions of the CPA, GoS forces took control of the main town in Abyei in May 2011 and dissolved the local government. The United Nations has responded by inserting over 4000 UN troops into the region to oversee the withdrawal of both GoS and GoSS armies. The UN estimates that approximately 110,000 people were displaced as a result of the May 2011 fighting in Abyei (Ottaway and El-Sadany 2012; IDMC 2011; CEIP 2011). Conflicts over Oil. Oil has long been at the center of conflict between the GoS and the SPLM ruling party in South Sudan. The secession of South Sudan resulted in the loss of approximately 75% of Sudan’s oil and upwards of 70% of government revenue. During the interim period from 2005 to 2011, oil revenues were essentially shared equally between the GoS and the GoSS. After independence, South Sudan stopped sharing oil revenues with Sudan, resulting in a loss of approximately US $1.7 billion per year to the GoS. In retaliation, and in an attempt to make up this lost revenue, the GoS threatened to charge exorbitant fees for the use of the pipeline necessary to transfer the oil from the fields in the south to the Port of Sudan and global markets. The dispute over oil revenues and transit fees continued to escalate throughout 2011 until South Sudan halted all oil production in February 2012. In September 2012, the GoS and the GoSS announced an agreement to create a 10-mile demilitarized zone along the contested border areas and to resume production and transit of up to 350,000 barrels of oil a day but the agreement has yet to be implemented as of March 2013(Ottaway and El-Sadany 2012; WSJ 2012). Darfur. In Darfur, conflict began over political control of the region and access to land and natural resources. Disputes between pastoralists and sedentary farmers had occurred in the past, but the traditional leaders – sheikhs, omdas and nazirs – mediated the disputes. In the 1970s, the traditional authority of the sheikhs and nazirs was replaced by local government councils. In the decades that followed, drought, famine and diminishing natural resources put pressure on cooperative agreements among diverse groups. Local government was ineffective at resolving disputes, and groups became polarized. In 2003, government forces attempted to take control of the region. In addition to its own official troops, the government sponsored a brutal militia, the janjaweed, who burned villages, killed, raped and maimed people and destroyed or stole crops and livestock. In an 8-year period, between 200,000 to 400,000 people died, and 2.5 million were displaced (Egemi 2006; UNEP 2007; Adams et al. 2006). Peace agreements signed by the government and the primary rebel groups in 2006 and 2010 have not been effective and violence continues. The Darfur Peace Agreement of 2006 called for the establishment of a Land Commission to resolve land issues in the region, including the arbitration of disputes over rights to land. The Commission was formed in 2007 and has been active in establishing a structural framework for its work, collection and codification of customary law, and mapping of land and natural resource uses. Because the Commission does not have an executive role, and the ability to enforce decisions, it has not been effective in resolving conflicts between sedentary groups and pastoralists. The Darfur Pastoral Routes Demarcation Committee (DPRDC) is another entity that was created to resolve disputes between pastoralist s and sedentary groups. The results of the work of DPRRDC have been challenged by sedentary farmers, and also by traditional leaders who have historically managed natural resources and handled conflicts over use of the resources, but who have been marginalized by the conflict and new leaders (UNEP 2012a; Egemi 2006). Eastern Sudan. Government allocation of large tracts of land for commercial agricultural schemes has led to resentment by local pastoralists who have lost access to lands that they have traditionally occupied. Loss of land and water rights by pastoralists has generated a great deal of conflict (Ottaway and El-Sadany 2012; Pantuliano 2007). Returning IDPs and Refugees. The steady return of refugees and IDPs in Sudan is expected to exacerbate existing conflicts over land-use and place demands on local institutions that lack capacity to manage the numbers of people needing resettlement assistance. The UNHCR estimates that at least 2.2 million people remained internally displaced in Sudan at the end of 2011. Areas that have been identified as particularly prone to conflict include South Kordofan (Nuba Mountains), Blue Nile, Abyei, Darfur, Eastern Sudan and Khartoum (USAID 2005; ARD 2009b; Pantuliano 2007; UNHCR 2012). Pastoralists and Grazing. Conflicts over control of grazing land and natural resources continue between different resource users in all areas of the country. In the Three Areas, clashes have intensified in recent years. The major conflicts in the area are: (1) between farmers and pastoralists; (2) within agro-pastoralists communities, as relatively powerful groups expand land areas at the expense of others; (3) between farmers and groups exploiting natural resources such as timber, palm trees and gum arabic; and (4) between returnees and laborers or sharecroppers on mechanized farms. The decades of war, combat experience and military training and access to modern weapons have increased the deadliness of local conflict (Pantuliano 2007; IRIN 2008). The systems of land ownership and control have not been able to accommodate the competing demands of pastoral nomads and sedentary farmers. As grazing land and water sources have diminished, pastoral groups have sought secure access to land and other natural resources. The conflict between pastoralists and farmers led to a leadership vacuum in many rural areas that was exploited by nomadic, landless rebel groups that grew in strength. Government efforts to subdue the rebels included using the janjaweed, a government-sponsored militia that used brutal and extreme methods (Lweytzkyj 2009; Parmar 2007; Pantuliano 2007; Egemi 2006). Dispute Resolution. Under the terms of the CPA, the Land Commissions are charged with arbitrating land disputes. However, only one of the four Land Commissions has been established to date, leaving dispute resolution to existing institutions in most of the country. Even in Darfur where the Commission has been established, dispute resolution is hindered by the Commission’s lack of authority to enforce implementation of decisions. At the local level, the Land Conflict Resolution Committees are, at least in theory, responsible for resolving land disputes. Customary authorities often participate in these committees, which are the local access points to the formal judicial system at the state and central level (UNEP 2012a; Alden Wiley 2010; De Wit 2001). Customary institutions have historically been used to resolve local land disputes. Local chiefs or sultans commonly resolve minor disputes. Matters can be taken to the Native Administration or to customary courts, in which traditional leaders such as sultans, omdas and sheikhs serve as judges. The customary courts enforce customary law to the extent that it is not inconsistent with statutory and Shari’a law. Customary courts can refer cases to the formal court system (Parmar 2007; Nucci 2004; Pantuliano 2007; Mohammed 2007). In 2012, USAID and UNEP supported a study tour to Kenya and Tanzania to help Darfur leaders learn about tenure and management arrangements which support local livelihoods on an environmentally sustainable basis, and which contribute to peaceful relations over resources. The study tour visit was in the form of a Learning Route, which is a continuous process of training in the field, organized thematically around successful experiences, case studies and good practice. At the request of the participating Darfuri institutions, a series of seminars were held in the 5 Darfur States to share the lessons learned from the study tour with a wider audience (including government and non-government institutions, among them government ministries, native administration, civil society, academic institutions, UN agencies, and NGOs). This had a substantial multiplier effect in terms of the number of beneficiaries who have benefitted from the study tour learning (Semunegus 2013). The Multi-Donor Trust Fund (MDTF) was created in 2005 to provide a vehicle for donors to pool resources and coordinate support for overall recovery and development needs in Sudan during the lifetime of the Comprehensive Peace Agreement (2005–2011). The funds are used on a range of recovery and longer-term development activities, including health, education, infrastructure and public sector reform. Donors include the Netherlands, Norway, United Kingdom, European Commission, Sweden, Germany, Denmark, Finland, Italy, Iceland, Greece, Canada, Spain, Egypt and the World Bank. The trust funds are administered by the World Bank, working together with United Nations partners, donors, civil society and the respective governments (World Bank 2011c). Supported by the United Nations Development Programme, the Darfur Community Peace and Stability Fund (DCPSF II) is anticipated to operate until 2015. The community-level conflict resolution and prevention services it provides aim to assist communities by: resolving conflicts over livelihood assets; creating income-generating opportunities; and securing access to natural resources. The fund also supports projects in Darfuri communities that promote peace and economic growth. The fund is supported by contributions from six donors, including USAID (UNDP 2012b). Sustainable Food Security through Community-Based Livelihoods Development is a project supported by the Food and Agriculture Programme of the United Nations (FAO) and implemented by the United Nations Industrial Development Organization (UNIDO). The project aims to bring about sustainable improvements in food security for 12000 households in Southern Kordofan. Started in 2011 and slated to run through 2015, the project focuses on: building community capacity to mitigate conflict and guide local development; increasing agricultural production at the household level; and increasing employment in off-farm livelihoods (FAO 2012a). In 2010, USAID signed a US $950,000 agreement with the GoS reestablishing the Famine Early Warning Systems Network (FEWS NET) across Sudan. The systems network will provide information to predict and manage threats to food security. The partnership marks the resumption of a program that had been closed in Sudan’s northern states since 1992 (USAID 2010). From 2006 to 2009, USAID’s Sudan Customary Land and Tenure Program (CLTP) provided technical assistance and material support for the implementation of the CPA with respect to the strengthening of customary land tenure in the Blue Nile and South Kordofan states. The project provided assistance to governments of the two states to prepare draft legislation to develop and amend the relevant laws to incorporate customary laws and practices, local heritage and international trends and practices and to implement any new laws regulating property rights and approved by the legislature. The CLTP also aimed to protect and formalize customary land and resource rights through the demarcation, mapping and registration of community lands, with the goals of resolving conflict, strengthening tenure security and improving participatory land-use management (USAID/REDSO 2006; Adams and Palmer 2007; ARD 2008; ARD 2009a; FAO 2008; UNEP 2007). In 2004, to help address the root causes of tensions between farmers and pastoralists in North Kordofan, Upper Nile and Sobat Basin, the Netherlands, CIDA and UNDP launched the 4-year Reduction of Resource-Based Conflicts project. The project’s specific objectives were to: promote institutional and legal reform in natural resource management to improve productivity and reduce conflict; strengthen capacity of government and civil society to manage natural resources and mitigate conflict; design and promote measures to reduce and better manage risk in pastoral livelihood systems; promote a culture of peace; and develop and promote clearer strategies for pastoral and agro-pastoral livelihood development (UNDP 2012a). The FAO previously worked in Darfur on the creation of the Land Commission and development of a land policy. The United Nations High Commissioner for Refugees worked on reintegrating internally displaced persons and building governance capacity. The Norwegian Refugee Council (NRC) collaborated with both the FAO and UNHCR to conduct studies of land and property issues related to IDPs. INTERSOS, a nonprofit humanitarian organization, has monitored and mapped secondary land occupation (FAO 2008; Adams and Palmer 2007; Pantuliano 2007). In urban areas, UNDP has provided the government with technical support for urban policy development and planning under its Urban Management Programme, which ended in 2009. UN-Habitat and USAID have: supported assessments of land, spatial planning and housing; supported review of legal frameworks governing land rights; and conducted capacity building programs related to urban planning. UN-Habitat has been implementing a project in Darfur to support the resettlement of IDPs, focusing primarily on issues of land tenure and developing alternatives to wood-based housing construction (Pantuliano 2007; UNEP 2007; UN-Habitat 2012b). Sudan is composed of varied climatic zones, including the northern desert and extensive savannah in the south. Annual rainfall varies from 200 millimeters in the north to 800 millimeters in the southern border regions. In the south and central regions much of the agriculture is rainfed, while in northern and eastern Sudan irrigation plays a significant role. Annual variability and relative scarcity of rainfall, particularly in the north, cause loss of vegetation, leaving land vulnerable to overgrazing and erosion. The central and northern states have experienced repeated and prolonged droughts in recent decades, causing loss of livelihoods, displacement and localized famine. Severe flooding is also common in Sudan, eroding soil and destroying housing, infrastructure and crops (UNEP 2007; FAO 2005). Sudan has significant freshwater resources. The Blue Nile, which flows into Sudan from Ethiopia, and the White Nile, which comes from Uganda through South Sudan, join in Khartoum to form the Nile River. The Nile River flows north into Egypt to the Mediterranean. Sudan shares its surface and groundwater resources with neighboring countries and is a member of the Nile Basin Initiative (NBI). The variability of river flows necessitates water storage in large reservoirs. Prior to the secession of South Sudan, the country had 1272 cubic meters of internal freshwater resources per capita. Annual water withdrawals are used almost entirely for agriculture (97%), including irrigation and livestock uses (FAO 2005; World Bank 2011b; NBI 2010). Sudan has sufficient fresh water resources to supply drinking water to all residents except in the northern desert regions. However, access to drinking water is hampered by the lack of extraction and purification infrastructure. Insufficient water supply and contamination are problems in Khartoum and surrounding urban areas. A 2006 survey reported that 135 of every 1000 children born alive died before the age of five. Forty-eight percent of those deaths were due to diseases associated with unsafe water and inadequate sanitation (USAID 2010; USAID 2007; UNEP 2007). For centuries, the waters of the Nile River in Sudan, characterized by numerous tributaries and annual flooding, have been used for irrigation. Traditional irrigation systems, such as the shaduf (a device to raise water) and waterwheels used to lift water to fields, were gradually replaced in the early 20th century by more efficient mechanized pump systems and the use of dams, reservoirs and canals to support agribusinesses, including cotton and sugar plantations. Small areas are irrigated by groundwater (Metz 1991; FAO 2008). The construction of dams on the Nile has been a source of conflict and land insecurity in Sudan. Completed in 2008, the Merowe Dam in northern Sudan doubled the country’s electrical generation capacity, but reportedly displaced more than 50000 people from their homes in the Nile Valley. The forced evictions have drawn concern from international environmental NGOs and human rights groups. The GoS is planning two more large dams on the Nile at Kajbar and Dal that could potentially displace another 20000 people. Other dams under construction include the Rumela on the Upper Atbara River and Burdana dam on the Setit River, both of which lie in Eastern Sudan, and the heightening of the Roseires dam on the Blue Nile (Bosshard 2011). The former Constitution of the Government of Sudan (1998) provided that all subterranean and surface water resources are public property. The 2005 Interim National Constitution does not address ownership of water, but simply provides that the state is responsible for the sustainable use and management of natural resources (GoS Constitution 1998; UNHCR 2005; Alden Wily 2008; EcoLex 2009). Water rights are primarily a matter of state and local legislation in Sudan. State and regional governments establish water corporations, which set regulations governing access to water. State governments typically control certain water sources, such as boreholes, borewells, surface wells and reservoirs (hafirs), for which they charge use-fees. Additional water sources are provided by private individuals and entities. Separate regulations (and sometimes separate water corporations) govern urban water and drinking water. Sudan’s use of water in the Nile Basin is subject to international agreements and obligations related to its membership in the Nile Basin Initiative (UNDP 2006; Adams et al. 2006; NBI 2010). The primary laws governing water resources include the Civil Transaction Act (1984), the Water Resources Act (1995), and the Groundwater Regulation Act (1998). The Civil Transaction Act provides that the right to develop and access water corresponds with the right over the land, so long as the respective use is sanctioned by the relevant water authority. The Act also provides that access to public waters is available to all people but must be obtained through a contract. The Water Resources Act established the centralized body now known as the General Directorate of Water Supply that is responsible for national water policy, oversight over large water projects, and capacity development of the water sector. The Water Resources Act also granted states the authority to establish State Water Corporations that serve as the lead agency responsible for water resource development, utilization and management. The Act also stipulates that no groundwater or surface water from the Nile may be extracted without obtaining a permit from the Ministry of Irrigation and Water Resources. The Groundwater Regulation Act grants authority for issuing permits for the construction of groundwater point to the Groundwater and Waddis Directorate (UNEP 2012a). Under Islamic law, water is a public resource for all people to access. People have a right to drinking water for themselves and their livestock, and they have a right to use water for irrigation for farming. Access to water sources is open to all and water must be used and managed in a manner that does not prevent the use of the resource by others. Where water is not available in quantities to serve all needs, those nearer the source have first rights to the water, if the water is drawn from a source that requires no artificial means of extraction. If effort and investment must be made to extract water, allocation is determined based on the effort made and the needs of various users (ISESCO 2010; Caponera 2001). Under most customary law systems in Sudan, community members have a right of access to land and water. Pastoralists have the right to use pasture and surface water in any part of their tribal areas. During periods of migration, pastoralists access water on land by agreement with landholders and other users of the natural resources. Strategies pastoralists use to overcome water shortages include: (1) constructing new water sources in water-deficit areas or transporting water over comparatively short distances by donkey or camel; (2) balancing herd size; (3) adjusting the positions of different species and classes of livestock in relation to water supplies and conserving the water and grazing at or around the most permanent and reliable water points (fallback or dry-season water points); (4) selecting more drought-resistant breeding stock and managing the timing and frequency of drinking; and (5) regulating access to water points (Adams et al. 2006). Competition over water resources is a common cause of local conflict, especially in areas where resources are limited, such as Darfur, and where pastoralists and sedentary farmers share resources, such as in the central region. Customary laws and traditional practices governing access to wells and rights to river water may not be adequate to address the needs of growing populations of people and livestock, especially in areas experiencing a reduction in water availability or water quality. In June 2009, clashes over water and grazing rights in the border region between South Kordofan and Darfur resulted in the deaths of 250 people (USAID 2005; FAO 2008; The Guardian 2009). The Ministry of Agriculture and Irrigation (MAI) oversees the agricultural corporations that manage large irrigation schemes. The Ministry of Water Resources and Electricity (MWRE) is responsible for delivering irrigation water and is legally responsible for all water matters, including: supplying water; planning and managing water resources; creating and managing irrigation programs and facilities; providing for hydropower generation and protecting the water-related environment. The Khartoum State Water Corporation serves Khartoum and surrounding urban areas (UNEP 2012a; FAO 2005). Sudan is a founding member of the Nile Basin Initiative, a cooperative institution formed by ten riparian countries in 1999. The purpose of the NBI is to achieve sustainable socioeconomic development through the equitable utilization of, and benefit from, the common Nile Basin water resources. The NBI has a grant-funded Shared Vision Program that supports activities to build an enabling environment for investment, and a Subsidiary Actions Program for specific investments, such as irrigation and hydropower. The initiative also seeks to reverse land degradation and improve environmental management. In 2010, several Nile Basin countries proposed a new framework agreement for governing the basin that includes the creation of a permanent commission to manage the Nile waters and guarantee equitable allocation of its resources. Sudan and Egypt have refused to sign the new framework agreement due to concerns related to the water-sharing provisions (VOA 2011; Cascao 2009; USAID 2007). In the late 1990s and early 2000s, Sudan devolved some authority for management of water resources to local communities. The government transferred the operation and production of large- and medium-sized irrigation schemes from state-operated enterprises to the farmers. In addition, it established a system of voluntary water-user associations to manage the irrigation system below the minor canal level. The government also grouped, rehabilitated and handed over the small pump schemes in the Blue Nile and the White Nile that had been run by the government. In North Kordofan, with the help of an NGO, local communities constructed ten new reservoirs in the late 1990s. The local communities formed management committees to manage the resource, including charging a fee for water use. In 2004, the Water Corporation of North Kordofan State passed a law bringing all reservoirs under its jurisdiction, including rights to water fees. The case went to court, which ruled that the community owned the reservoirs. The Water Corporation agreed to recognize the authority of the local management committee, and the parties agreed to share proceeds for water sales (FAO 2005; Adams et al. 2006). The U.K.’s Department for International Development supports the Sudan Integrated Environment Programme (2009-2013), implemented by UNEP. The Programme’s objective is to improve sustainable and equitable governance, management and use of environmental resources. The program focuses on environmental research and policy, biodiversity, forestry policy and water resources conservation (DFID 2012a). UNEP is supporting the Ministry of Water Resources and Electricity in their implementation of Integrated Water Resource Management (IWRM). This assistance includes supporting research into surface and groundwater resource sustainable use, promoting the use of environmental impact assessments for water infrastructure projects, and contingency and prevention planning for flood and drought (UNEP 2012c). FAO has implemented a project to support policy consultation and actions that boost sustainable use of water and energy resources for agricultural production and livelihood improvement. The 2010–2012 project, implemented in the Near East and North Africa Region (including Sudan) addressed sustainable water and energy use within the context of climate change (FAO 2012a). USAID has also supported the rural water supply and sanitation sectors, including capacity building for rural water managers. USAID provided funding for the Water for Recovery and Peace Programme (WRAPP), which included activities to enhance communities’ water management capacities, rehabilitate rural water supply systems and develop urban water distribution programs and rainwater harvesting. The WRAPP operates in South Sudan and the Three Areas of Sudan (USAID 2007; PACT 2012). The Council of Ministers of Water Affairs of the Nile Basin and the World Bank organized the Nile Basin Initiative, as discussed above. The NBI is funded by contributions from NBI countries as well as the World Bank, Global Environmental Facility (GEF), African Development Bank (ADB), UNDP, FAO and other donors. In Sudan, the Initiative has worked on flood preparedness, transboundary water quality issues and wetlands protection (World Bank 2008b). Sudan lost a significant portion of its forests as a result of the secession of South Sudan. Sudan still retains a range of forest types, reflecting regional variations in climate and soil. Forests cover approximately 18.7 million hectares in Sudan, 10% of the country’s land area. Desert and semi-desert trees and shrubs and riverine forests are found in the northern region of the country, and woodland savanna can be found in the central and southern regions. Most of the country’s forests are open or semi-open habitat. Forests and woodlands outside of Sudan’s official forest reserves are threatened by expanding agriculture and urbanization or are otherwise degraded through unsustainable exploitation to meet the country’s energy needs (FAO 2012b; FAO 2003; UNEP 2007). Sudan’s forests are important sources of food, timber, firewood and habitat. Forests also provide fodder for livestock, marketable non-timber products such as honey, gum arabic, tubers and roots, wild game and medicinal plants. Forests contribute to watershed quality by stabilizing soil, reducing off-site sedimentation, reducing flood peaks on streams in small watersheds and replenishing groundwater and watercourses. These ecological stabilization functions also protect hydropower resources and irrigation systems. Mangrove forests located along the Red Sea coast hold excess nutrients and pollutants that could otherwise flow directly into coastal lagoons and coral reefs. In the northern deserts, trees stabilize sand dunes and provide shade (FAO 1999; Rahhal and Abdel Salam 2006; UNEP 2007). Sudan is responsible for 80% of the world’s gum arabic production and trade. North Kordofan and North Darfur states are the largest producers of gum arabic in Sudan. Gum arabic is produced from the sap of the acacia senegal (hashab gum) and acacia seyal (talh gum) and is used as a non-toxic binder in a multitude of products, including food and pharmaceuticals. Gum arabic is used in the syrup for soft drinks, to make the adhesive on postage stamps, and for dyes and watercolors. The gum arabic industry provides a critical source of income for rural communities with forestland access (FAO 1993; FAO 1999; UNEP 2007). Between 1990 and 2005, then-unified Sudan lost an estimated 12% of its forests (8.8 million hectares). Most of the deforestation has occurred in the northern, eastern and central regions of the country. In northern and central Sudan, and in IDP camps across the country, the unsustainable extraction of fuel wood is a major cause of deforestation. Most of the remaining forests are located in the Three Areas, in the southern and central regions and in what is now South Sudan. The steady degradation and loss of Sudan’s forests are attributed to the population’s reliance on wood to meet energy needs, drought and desertification in the north, the expansion of mechanized agriculture and the lack of effective forest governance (UNEP 2007; FAO 1999). The Forests and Renewable Natural Resources Act of 2002 (FRNRA) governs forest rights and the use and management of forest resources in Sudan. The FRNRA also identifies the objectives of the National Forest and Renewable Natural Resources Corporation (NFRNRC) (previously the Forests National Corporation) in managing the nation’s forest. The FRNRA assigns management of federal forest reserves to the NFRNRC, and management of state forest reserves to forest administrations in the states in accordance with NFRNRC policies and technical plans. The FRNRA also identifies the formula for sharing revenues derived from forest resources. States are entitled to receive 40% of revenues generated within their territory from forest resources and the Federal Government receives the remaining 60%. The Act also recognizes the rights of pastoralist to access and pass through forest lands, although the NFRNRC has the discretion to limit such access rights. The Timber Utilization and Management Act of 2003 regulates the issuance of timber utilization contracts and grants of timber rights. Enforcement of Sudan’s forestry laws has been nearly nonexistent due to weak capacity and lack of resources (UNEP 2012a; FAO 2007; UNEP 2007; FAO 2006). Recognizing the significance of the country’s forest resources, the numerous threats to forestland and the potential for sustainable use of forest products, in 2002 the GoS asked the FAO to provide support to revise the country’s forest policy and legal and institutional framework. The policy statement was prepared using a participatory process that sought input from local communities, civil society, government, political parties, industry experts and other stakeholders throughout the country. The final policy statement was completed in 2006. Consistent with the terms of the CPA, the policy embraces a broad set of objectives: (1) governance through the NFRNRC at the federal level and forest administrations at the state level; (2) managing the sector in a sustainable manner that contributes to poverty eradication, increases rural incomes and protects the natural environment; (3) reversing the trend of forest cover loss by facing and dealing with the deforestation, desertification and environmental degradation problems; (4) maintaining the competitive advantage of the forestry sector; (5) including rural people, civil society and other stakeholders in decision-making and ensuring that they benefit from the use and conservation of forest resources; (6) securing tenure for forestry lands, and harmonizing and regulating stakeholder activities in the forestry sector; (7) developing job and income programs; and (8) preserving biodiversity (FAO 2006). Forest tenure types include protected areas, forest reserves (federal, state and institutional), community forests and private forests (including corporate forests). All unregistered forestland is considered state land over which the National Forests and Natural Resources Corporation has authority (UNEP 2007; FAO 2003). Private entities, NGOs and communities can apply for concessions for forest areas, including land in reserves. Licenses are required for the felling and exploitation of trees on forestland. If forestland is used for agricultural development, at least 15% of the total area of a rainfed scheme must be retained as forest as a shelter area; for an irrigated scheme, the minimum that must be kept as shelter is 5%. Enforcement of forestry laws is severely limited lax as the government lacks capacity and resources (FAO 2007; UNEP 2007). Exploitation of non-plantation timber resources requires a Timber Utilization Contract. The government must approve any transfer of rights under the contract, and extracts a fine from the transferor. Timber utilization contracts can be lost due to inefficient exploitation or because the land is no longer deemed suitable for timber harvesting. In the latter case, the government allots another area for timber extraction (GoS Timber Utilization and Management Act 2003). The Ministry of Environment, Forestry and Physical Development is responsible for Sudan’s forestlands. In 2002, the government renamed the Forests National Corporation as the National Forests and Renewable Natural Resources Corporation (NFRNRC). The NFRNRC is a semi-autonomous, self-financing organization responsible for: enforcing the legislative framework governing forests; encouraging the establishment of forests and rangeland; intensifying afforestation; developing the production of gum arabic; and encouraging community participation in sustainable development. The NFRNRC has responsibility for: conducting studies of forest resources; establishing forest reserves; advising on forest policy; and coordinating with relevant authorities on land use and investment. A 2006 UNEP assessment of the forestry sector found that the NFRNRC had a well-designed organizational structure and a technically competent staff, but lacked support at the state and local levels to support its authority and activities (UNEP 2007; GoS Forests and Renewable Natural Resources Act 2002; Semunegus 2013). The National Forestry Policy Statement of 2006 recognizes several key factors in the sustainable management and use of the country’s forests, including: improvement of pastoral systems to achieve sustainable grazing; adoption of a land-use plan; and development of mechanisms and institutions to address land conflicts. The policy statement provides that the yet-to-be-formed National Land Commission will collaborate with the forestry sector to promote: (1) the adoption of a new land tenure system that clarifies property rights on forest and rangeland, and (2) economic efficiency in land use. Reforms will be aimed at diminishing conflicts and increasing productivity, and will be carried out with strict commitment to accountability, transparency and the provision of adequate information to all stakeholders, including disadvantaged groups. The policy options will openly deal with the need to review overlaps and contradictions between customary and formal forest resources property rights systems. Given the failure of the GoS to establish the National Land Commission, the reforms outlined by the policy have not been developed to date (FAO 2006). The Sudan Integrated Environment Programme, implemented by UNEP and supported by DFID, begun in 2009 and slated to run through 2013, aims to support sustainable and equitable governance, management, and use, of environmental resources. Its focus is on environmental research and policy, biodiversity, forestry policy and water resources conservation (DFID 2012a). UN-Habitat’s Darfur: Preparing for Sustainable Reconstruction of Shelter, Community, Infrastructure and Land Tenure project (2007-2009) aimed to lay a foundation for post-conflict sustainable recovery in Darfur through the adaptation and implementation of woodless building techniques sustainable natural resource use. One of the main activities was changing the building technology to avoid accelerated deforestation both before and during the return of displaced persons (UN-Habitat 2012b). The FAO is engaged in activities to support the sustainable use of forest resources through: the establishment of nurseries for reforestation; the production and use of fuel-efficient stoves to mitigate deforestation; and the development of fodder banks to improve grazing and pasture protection during dry seasons. The FAO has also begun developing community-based negotiation and mediation mechanisms for communities to manage natural resources (FAO 2008). Once rich in oil, Sudan now faces the reality that approximately 75% of the known reserves in the region are found in what is now South Sudan. Although the reserves are in South Sudan, the export infrastructure – including the pipelines, refining facilities and the Port of Sudan – are all located in Sudan. Thus, the two countries depend on each other for purposes of deriving economic benefit from the oil resource. Both nations are economically dependent on the petroleum revenues, which accounted for approximately 60% of GoS revenues and 98% of GoSS revenue in 2011. This situation has also led to conflict in recent years over revenue sharing and transit fees between the two countries (USAID 2005; FAO 2003; IRG 2007a; Alden Wily 2008; USDOS 2012; Sullivan and Nasrallah 2010; Ottaway and El-Sadany 2012; USEIA 2012). Extensive petroleum exploration began in the mid-1970s, and export began in 1999. In 2011, Sudan and South Sudan collectively produced approximately 425,000 barrels per day. As of 2010, unified Sudan was Africa’s fifth-largest oil producer and third-largest oil exporter. Based on exploration completed, total oil reserves (for both Sudan and South Sudan) are estimated to be 5 billion barrels. Much of Sudan, and particularly central and southern Sudan, has large unexplored areas that have the potential to hold significant oil reserves, and large-scale oil exploration is anticipated. Sudan also has significant gas reserves (about 3 trillion standard cubic feet), most of which is produced as a byproduct of oil production (USEIA 2012; Yager 2010; UNEP 2007). The principal oil and gas production facilities on the Sudan side of the border include: (1) production wells and initial treatment complexes in the fields of Heglig, Bamboo, Bamboo West, the Garaad, Taiyib, Toma and Fula; (2) four crude oil export pipelines connecting the fields to Port Sudan; (3) three refineries located in Khartoum, Port Sudan and Elobeid; and (4) a marine oil export terminal at Port Sudan. The border state of Abyei is thought to hold up to 15% of Sudan’s known oil reserves. Therefore, the outcome of its referendum on whether to stay part of Sudan or join South Sudan has major economic implications for both nations (USEIA 2012; Sullivan and Nasrallah 2010; Yager 2010; UNEP 2007). Lack of environmental regulation in Sudan’s oil and gas sector remains a problem. Environmental issues are often overlooked in the development of projects or the operation of project sites. The industry operates without much government oversight or scrutiny and little, if any, public consultation. Roads built through forests and remote areas by oil and gas producers cause erosion and flooding, and give those who would harvest timber illegally access to areas that were previously difficult to reach. Chemicals and effluent discharges by industry are poured directly into waterways. The large concessions allocated by the government for petroleum prospecting and extraction suffer from deforestation and soil and water contamination (UNEP 2007; FAO 1999; Sullivan and Nasrallah 2010). In addition to oil and natural gas, Sudan also has deposits of gold, silver, chrome, copper, iron, manganese, asbestos, gypsum, mica, limestone, marble and uranium (GoS 2008; GoS 2012). The 1998 Constitution provided that all natural resources, including those underground, are public property governed by the state. The 2005 Interim Constitution of Sudan does not assert the rights of the state to minerals, and provides limited details on management of the petroleum sector. The Interim Constitution does require, however, that sustainable utilization of oil as a non-renewable natural resource be consistent with the national interest and the public good, the interests of the affected states and local population in affected areas and national environmental policies, biodiversity conservation guidelines and cultural heritage protection principles. The 2005 Interim Constitution does not appear to have altered GoS assertion of ownership over all mineral resources or the country’s legal framework for granting access to mineral resources (GNU Interim National Constitution 2005; Alden Wily 2008). The exploration and production of oil and/or gas accumulations in Sudan is regulated by the Petroleum Resources Act of 1998 and the Petroleum Regulations of 1973. Under these laws, the Minister of Energy and Mining, with the approval of the Board of Petroleum Affairs, possesses the authority to enter Exploration and Production Sharing Agreements (EPSAs) with international oil companies. The EPSAs include all rights and obligations of the GoS and the oil company, including negotiated rates for recovery of costs and profit (Samasu 2004). Under the Comprehensive Peace Agreement (2005), communities have the right to participate in contract negotiations between the GoS and corporations for the development of resources located on their land. In practice, meaningful consultations do not occur, and customary rights to valuable subterranean resources are rarely recognized by the GoS. Rather, the existence of these resources often results in the displacement of customary users (Alden Wily 2008). The legal framework governing the sharing of oil revenue between Sudan and South Sudan is in transition. The Interim National Constitution mandated the equal sharing of oil revenue during the interim period. After independence, South Sudan stopped sharing oil revenues with Sudan. In response, the Sudanese government demanded that South Sudan pay US $32 per barrel in transit fees for use of the pipeline. South Sudan offered to pay less than US $1 per barrel for use of the pipeline. In January 2012, South Sudan shut down all oil production, claiming that the GoS was stealing oil shipped through the pipeline. Months of protracted negotiations failed to achieve an agreement, significantly affecting the economies of both countries. In March 2013, the two nations announced a deal that could result in the resumption of oil production by mid-2013 (Kushkush 2013; Ottaway and El-Sadany 2012; EIA 2012; Alden Wily 2008; UNHCR 2005). The 2005 Comprehensive Peace Agreement provides that existing oil contracts are not subject to renegotiation, although persons whose property rights were violated can seek compensation. The Sudanese People’s Liberation Movement (SPLM) claimed that oil contracts were made against the will of local communities that had owned the land under customary communal tenure. In some areas of the country, oil resource development is a cause of land-taking and displacement (UNHCR 2005). Joint ventures of Chinese, Indian and Malaysian companies lead the exploration and exploitation of Sudan’s oil resources. The Sudan National Petroleum Corporation (Sudapet) is a state-owned corporation that has a minority interest in the three largest ventures operating in Sudan and South Sudan: the Greater Nile Petroleum Operating Company, Petrodar and the White Nile Petroleum Operating Company (Yager 2010). The Ministry of Energy and Mining is responsible for the minerals sector. Sudan’s 2005 Interim Constitution established a National Petroleum Commission made up of representatives of the National and Southern governments, which is responsible for policy development, oversight of policy implementation and negotiation and approval of oil contracts. Since secession, the National Petroleum Commission has ceased operations (Semunegus 2013; UNHCR 2005; UNEP 2007). 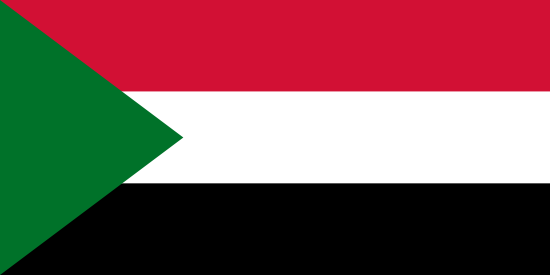 As part of the CPA process, Sudan established several institutions to monitor exploitation and revenue sharing, including the National Petroleum Commission and the Fiscal and Financial Accounting Management Commission. These institutions have ceased operation post secession (Semunegus 2013; USAID 2005).